Our facilities offer two racquetball courts as well as a full-length basketball court where we host noon ball for competitive players and volleyball leagues. We also have drop-in times available for our members. 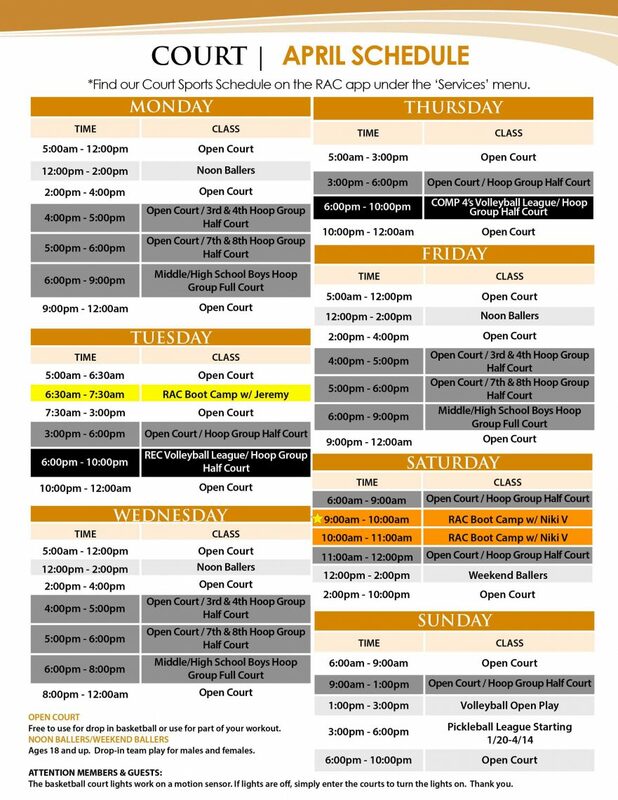 To reserve a Racquetball Court, please schedule at the Front Desk or follow our MY RAC ACCOUNT button. Raintree offers a seasonal basketball league, consisting of 8 teams of 10 players. Members & Non-Members Welcome. For more information contact courtsports@raintreeathleticclub.com. Free to use for drop-in basketball or use for part of your workout. Ages 18 and up. Drop-in team play for males and females. 5 on 5 pick-up games every Friday from 8pm-10pm in the basketball court. Stop in and sign up by writing your name on the white board in the court! Start your own group or join an existing hoop group to brush up on your basketball skills. Enjoy a team atmosphere to improve your game by practicing skills, fundamentals, and drills while competing and working together! Led by Coach Ty & Coach Kaipo. Private sessions available. Details & Pricing. RAC Boot Camp is a free one hour workout of high powered movements to target your whole body, improve overall strength and torch calories! You can expect high intensity circuits using weights and body weight as resistance. Co-Ed Recreational 6v6 league and Power 4s open to members & non-members. Team sign up is recommended. Individuals will be placed on a team. League culminates in single elimination end of season tournament. Winning team will receive League Champion t-shirts. Contact Ty at courtsports@raintreeathleticclub.com for more information. Ages 15 and up. Drop-in team play for males and females. No black-soled shoes are allowed on our courts. Eye protection is highly recommended for racquetball play. If you do not have goggles, ask at the Front Desk and they will provide you a pair.